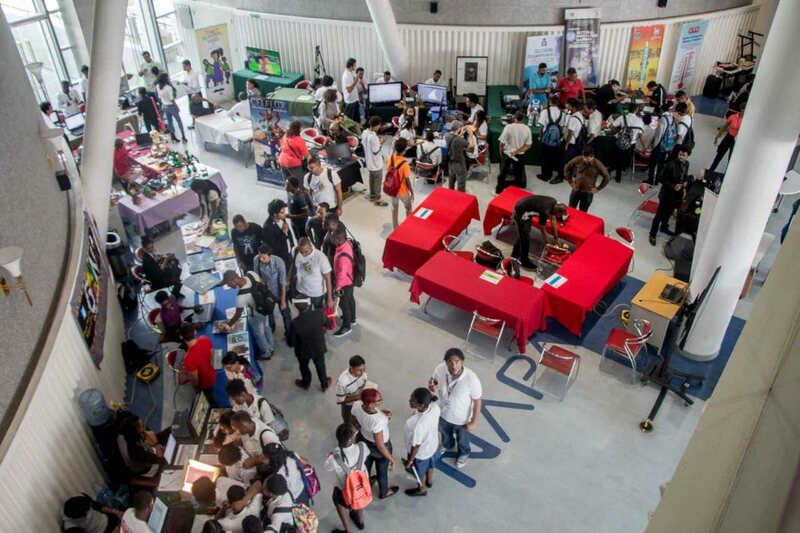 Aerial photo of the Animae Caribe Students Day in 2016 with multiple booths including virtual reality, gaming and robotics. 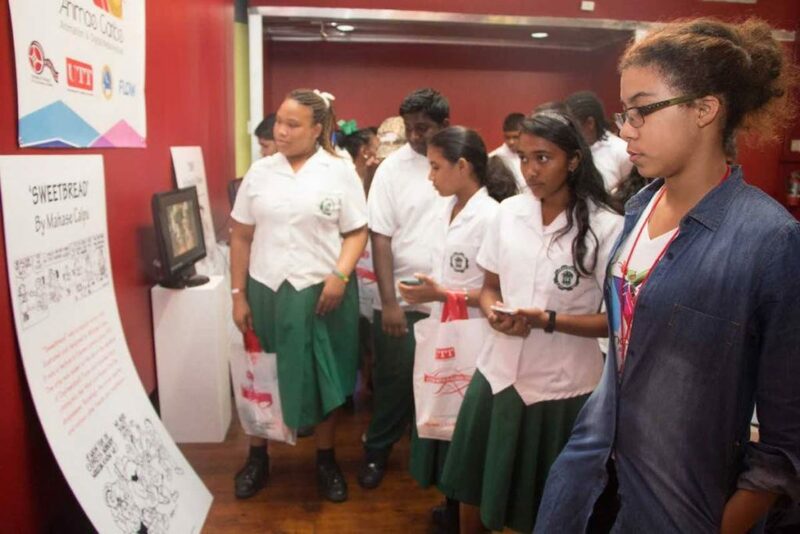 From tomorrow, the 16th annual Animae Caribe: Animation and Digital Media Festival begins. This year it will feature a project about a calypso-singing gecko, alumni who have worked on major Hollywood projects like The Jungle Book, and eight local animators pitching projects. But festival founder and programme leader for the University of Trinidad and Tobago animation department, Camille Selvon-Abrahams, said even with all these great things in the festival, the industry is on the edge and may move forward or fall on its face. Selvon-Abrahams, speaking during a telephone interview, recalled she was at a presentation by economist and Economic Development Advisory Board chairman Dr Terrence Farrell and he had said the creative industry was on the cusp,and one of two things would happen: either fall forward, move and fly – or fall on its face. She said if the local animation creators go international now and mess up they will never be given the opportunity ever again. Selvon-Abrahams said the animation industry, and the creative sector in general, do not need lip service and have had enough of it. She stressed that it was not just the State but also corporate TT which needs to put its money where its mouth is. She said the corporate sector must look at its corporate social responsibility, and the creative sector needs that kind of push, because it was not oil and gas. On the festival, she said the fact this is the 16th year is a feat, and it was really important for people to understand it has been happening for quite a while. She said there is interest from youths about utilising technology and keeping the industry going. Previous festivals had workshops and representatives from studios like Disney and Pixar; this year’s will focus on tangible outcomes that will have an impact on the industry in the areas of production, alumni and local content. students through the exhibition during the 2016 iteration of the festival. On production she said the festival has partnered with the British Council and the Inter-American Development Bank (IDB) to produce a pilot for a series called Gecko about a calypso-singing lizard who leaves the Caribbean for London. The alumni to be honoured are: Anthony Baptiste, who works with visual effects studios MPC London in the industry and blockbusters like The Jungle Book, Wonder Woman and Pirates of the Caribbean: Dead Men Tell No Tales; Danielle Blaize, who has exhibited her work at numerous Anime events, is working on a comic, Spiritbound, and collaborating with Barbadian game designers Couple Six, Inc on Le Loupgarou; and Shane Young Sing, who is a caricature artist, currently attached to the Animated Comedy Big Man Dan. Selvon-Abrahams said it is important to pass the festival on to alumni and festival co-ordinator is past student Jessica Yaw Ching. On local content, she said eight content creators will be pitching their series on the Thursday of the festival and three will be chosen to be produced.With all these things happening, she said, it has been the most challenging year for Animae Caribe with the downturn in the economy and it was the British Council and the IDB that stepped in to save the festival. Institutional support from the University of Trinidad and Tobago made a huge difference. She said the animation industry has to look at different models to survive, including going international, and though it has been quite a challenge it cannot stop now. For more information on Animae Caribe Animation Festival, check them out on Facebook. Reply to "Animation industry on the edge"